Radiology, Inc. provides a Vascular and Neuro Interventional Radiology service provided by 5 fellowship trained interventional radiologists and 5 mid-level providers. Interventional Radiology (also known as IR) is a medical sub-specialty of radiology utilizing minimally invasive, image-guided procedures to diagnose and treat diseases and medical conditions in nearly every organ system. 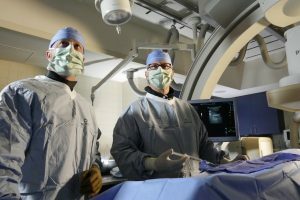 The concept behind interventional radiology is to diagnose and treat patients using the least invasive techniques currently available in order to minimize risk to the patient and improve health outcomes. These procedures have less risk, less pain and less recovery time in comparison to open surgery. IR has the potential to be a significant opportunity for hospital outpatient growth and cross-service line integration. Implementing a clinical IR practice now can keep health systems ahead of changes in the medical landscape. IR can reduce the length of hospital stays, minimize potential complications and save lives.